I find name-tags really important for the safety of your dog. I is also good as an accessory too. 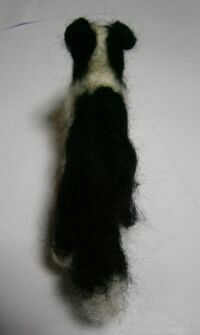 And I ordered a new one for Islay, and it arrived! It's really cute, with Sakura (cherry-blossoms) design, and has a mongel's drawing, very much like Islay on it! 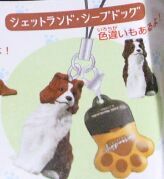 Also bought 2 Sheltie key-chains as well. 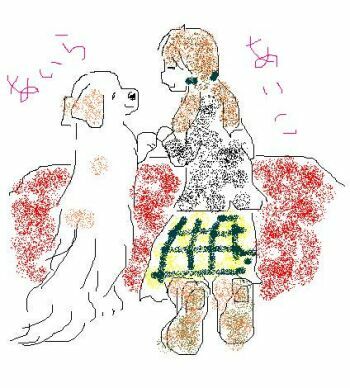 The doggy drawings are really very sweet. I ordered the 3-legged red wine, and it arrived today! I really wanted to try this wine, with the label of Port, the winemaker's dog. 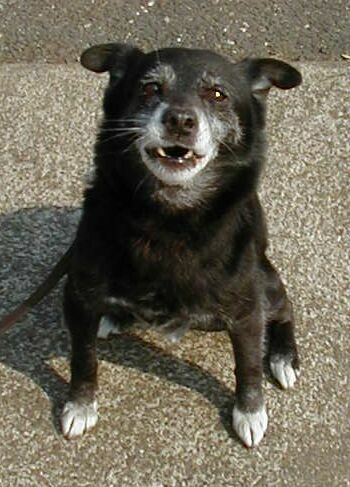 He was rescued from an attacking Pit Bull, but lost a leg, thus 3-legged. I heard it tastes good for a table wine too, looking forward to tasting it! I also won a movie ticket to a movie, "Chanko". Chanko is sumo-wrestlers food. 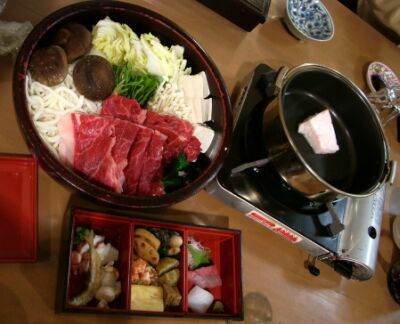 It really means any food, anything from curry to hamburgers etc to the sumo-wrestlers, but it normally refers to the type of steam-boat eaten by sumo-wrestlers. There was a movie called "Shiko Funjyatta", about sumo-wrestling years ago, and my friend from my Universtity was in it too, as a foreigner wrestler. 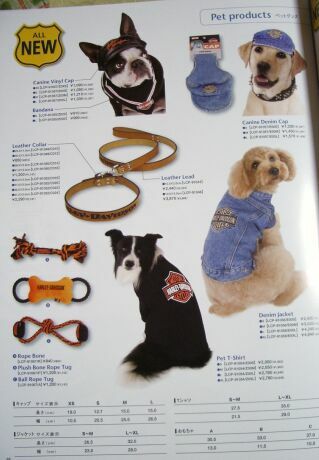 Also, the Harley-Davidson catalog arrived today! 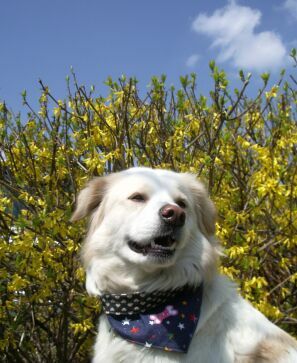 Islay's friend, Rai the Border Collie, modelled for the Harley-Davidson doggy goods. he looks really good in the photo! 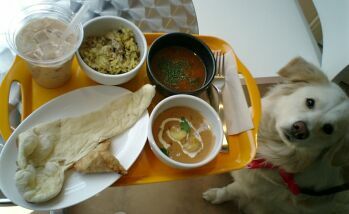 Today was the opening day for a curry shop near our place. 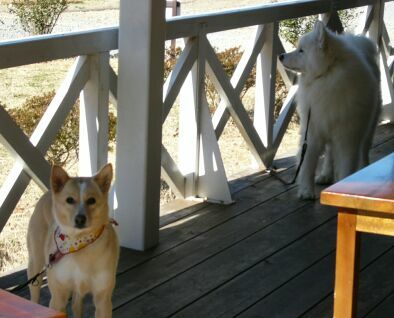 You can eat with dogs outside, so I went to try it. Well... the taste was... mmm... not something I'd go again, but still, it's fun to try out new places with Islay! 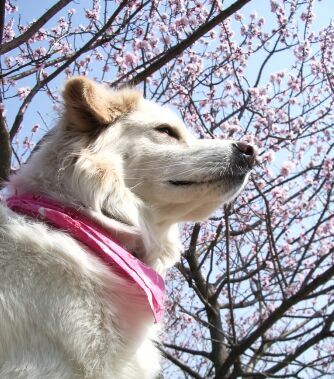 The sakura's steadily blooming. Perhaps it'll reach full bloom this weekend! The fact is, I have not yet started tidying up my place. Instead, finally I bought things to send to Texas (Jane, sorry for the delay!!! will send Nana's magazine etc soon! ), and other things I have been procrastinating for a while. Anyway, while doing so, I found a new curry shop that will open this 31st. 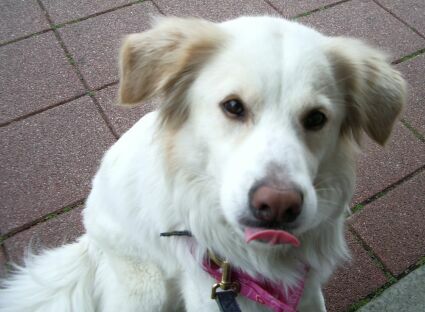 There was a table outside too, so I asked them if I can bring Islay along, and they said yes! Wow, now I can go and eat curry with Islay! 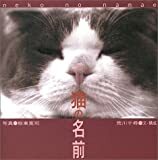 ▲ by angeline | 2006-03-28 17:03 | 思うこと書きなぐり Misc. 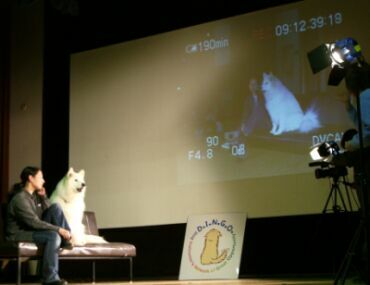 Today, we got a phone call from Fuji TV station. 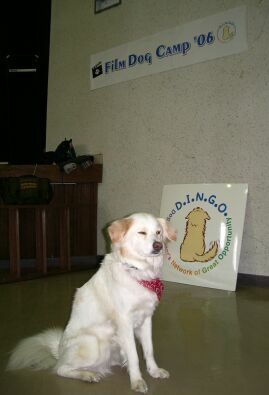 Islay will be featured in a doggy program Today's doggy (Kyouno Wanko). 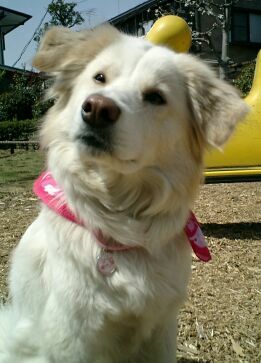 It's a very short program introducing homy doggies, but every month there's a Special version which is a little longer, and Islay will be featured in the special! Hopefully the shoot will go smoothly next month, so that she will really get to be on TV. But one big problem... my house is in a MESS! Yes, I mean a HUGE MESS! I really HATE housework, and can't keep the place clean and tidy... and they'll be filming the house too! 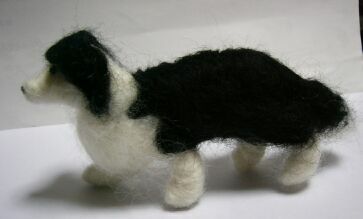 I have to clean up the place, but when I'm under pressure, I start doing other things... and I started making a Fleece Doggy again! 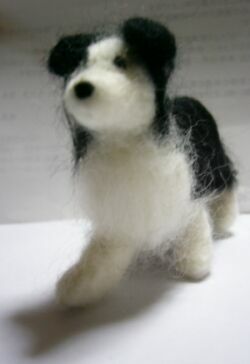 This time, I made a minature Santa, a Border Collie who's Islay's boyfriend! 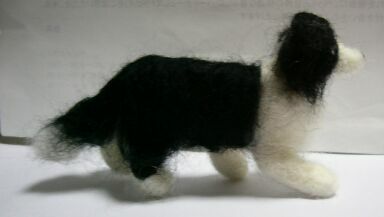 Santa's owner married last month, so I intend to make this a wedding gift! Hope they'll like it! But just had to show you this photo! We met 2 very nice mongrels today, a terrier-mix Piccolo (middle), and Puririn (left), who really looks so much like a minature Islay!!! SOOOOOO adorable!! 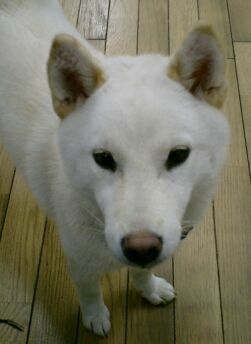 This entry are jokes that can be understood in Jap only... so I shall explain only the photos. 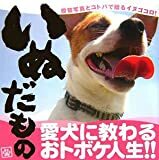 This is my collection of photos of doggy stars of Japan! 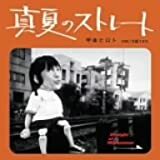 ▲ by angeline | 2006-03-26 01:35 | 思うこと書きなぐり Misc. I've introduced the Pitawan Nation in this weblog before, but in the latest Pitawan News in the Pitawan website, Islay and Suzie introduced a new liquer! 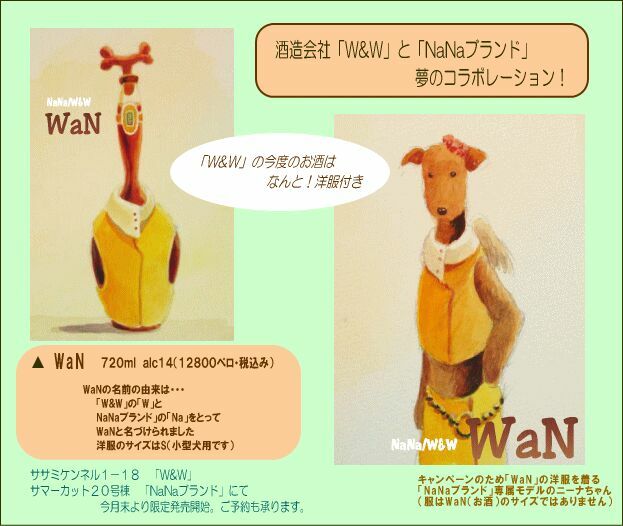 It's called WaN, and dressed in a cute costume. Oooh, I'd really like to taste i! 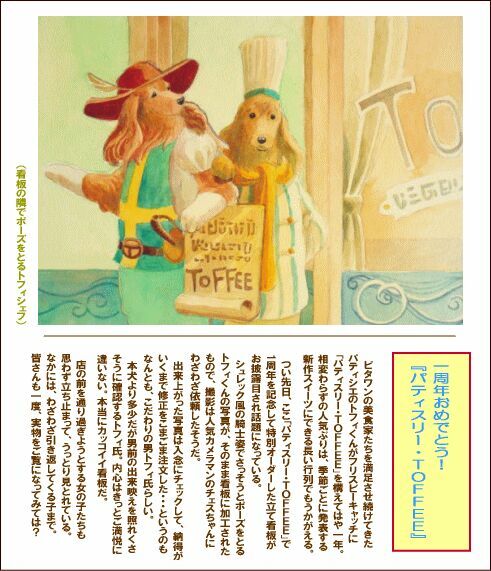 Islay's friend, English Cocker Spaniel, Toffee's sweets shop has celebrated 1st anniversary too! Congrats! This lovely story of Pitawan, will become a book soon, and will be published in coming June or July. Really looking foward to seeing it in the stores! I have other diary-like stuffs to up too, but needs lots of thinking before writing, so I shall up mainly photos today! 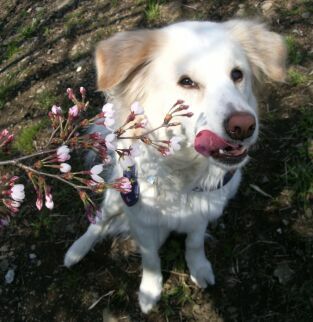 It's getting much warmer nowadays, so we get to meet lots of Spring Flowers in our neighbourhood! 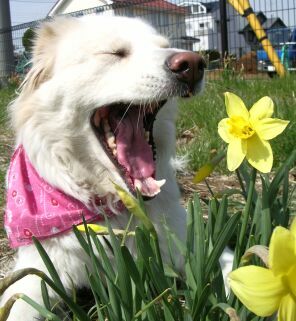 It sure is fun going around greeting the Spring Flowers on our walks! Yellow is one of my least favourite colour... but when it comes to flowers, I think yellow is beautiful! Another different type of yellow flower. Should I take a bite? 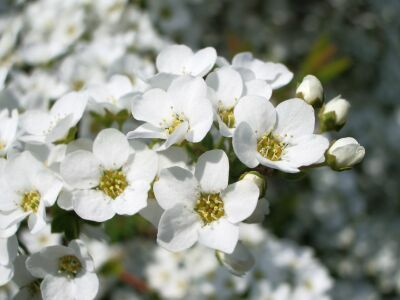 There are these little white flowers too, which look like a waterfall. Closeup of the white flowers. 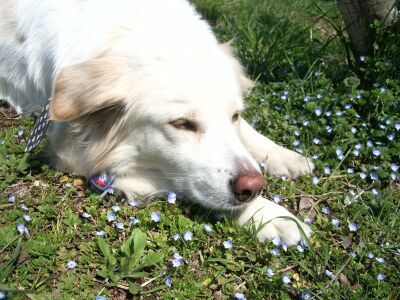 There were small flowers blooming on the ground too. 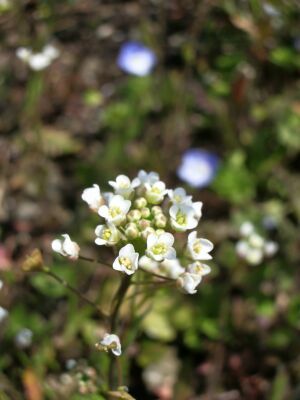 The blueish flowers that can be seen in the background of the white flower in the above photo, were blooming everywhere too! Another different type of yellow flowers. Yellow flowers go really well with the blue sky! These aren't flowers, but the red coloured leaves were beautiful. 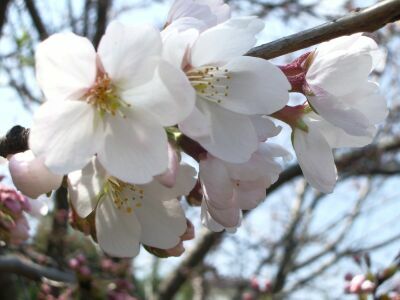 But what I look foward to most are the sakura, cherry blossoms! I always take lots of sakura photos every year. 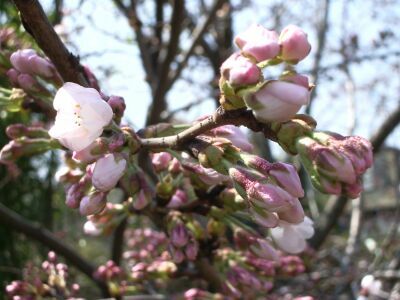 The buds are already about to burst, ready to go into full bloom. In fact there are some that couldn't wait for the others, and are blooming already! 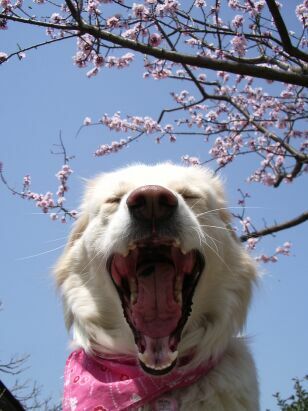 Really waiting for the sakuras to go into full bloom! 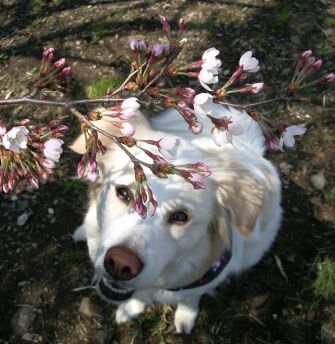 Actually, we have a little sakura tree in our garden too. Went to check it out just now, but they seemed not ready yet. 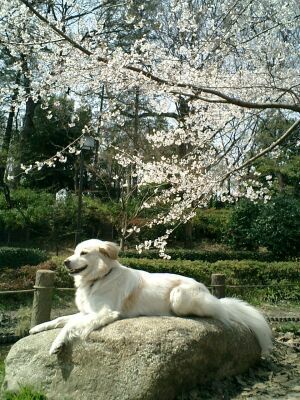 But am really looking forward to this sakura too! Tomorrow is expected to be rainy, so the lure-racing competition was cancelled... I was looking forward so much to it, so am quite disappointed. But it'll probably be postponed to June, and this time, at Yatsugatake area which is nice with lots of nature, so I guess we'll stay overnight and enjoy our trip in June! Hope we'll have better weather in June. 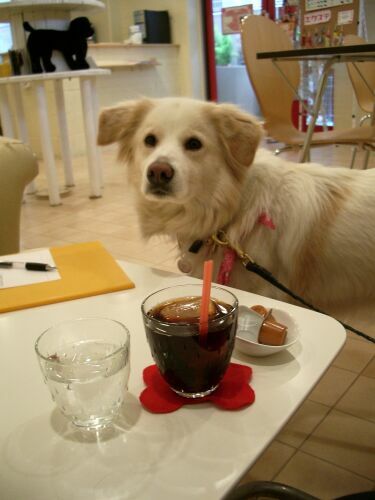 Nori, who is forever busy with his work, is not home today again, and since it'll be rainy tomorrow, I decided to take Islay for a long walk plus doggy cafe. There are still a number of cafes in our neighbourhood which we haven't visited yet. I decided to let Islay choose which direction she wants to go to, and she led us to Roka park, so we went to the cafe near the park. The food was pretty good, comes with drinks. 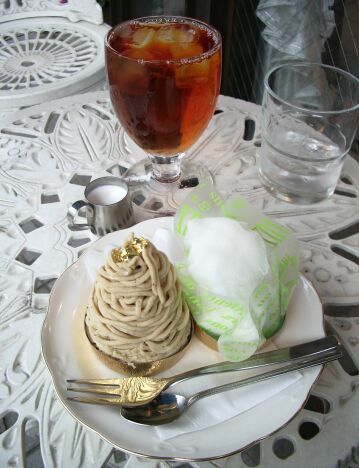 It was a pretty cafe, white theme, so pretty good for taking photos too! We left the cafe, and went to the park for a nice walk. The park was under construction at many places, but the flowers were beautiful! 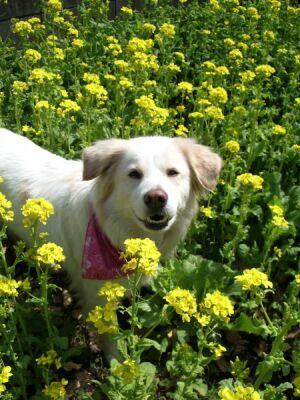 The yellow flowers were so lovely, and the other flowers too! We ended up staying out for over 4 hours, so Islay seems exhausted now and sleeping soundly! The park was undergoing a lot of renovation. The new walk path looked really nice! Reminded me of the yellow brick road that leads to the Emerald City, in the Wizard of Oz! 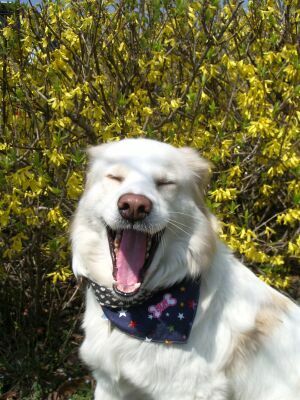 Makes me want to sing down the road, with Islay at my side. 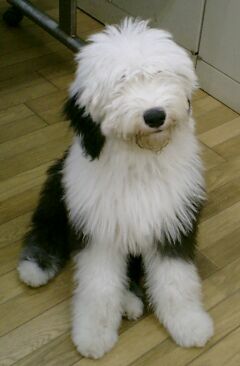 Islay, as Toto? No, No! Islay is more like the Cowardly Lion!! After the cafe and walk... I felt that something was missing... oh yes! Desserts! When I thought about it, I started craving for cakes. I haven't eaten cakes since the "diet" started. Me on a diet? Of course not! 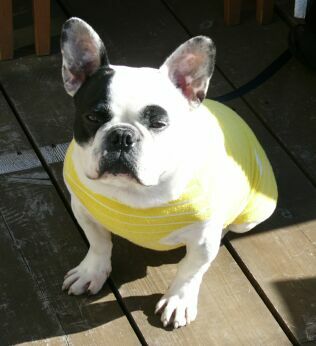 Nori was told by the doctor recently at his company's medical checkup, that he's overweight, and he started going on a diet. i.e. no more buying cakes, so I too had no cakes to eat! So when I thought about it, I wanted it so much we went to my favourite cafe... and ate 2 cakes, not 1!! Couldn't resist the temptation... Anyway the cakes were GREAT! Anyway, I found this Gacha-Gacha (machine where you put a coin in, and turn, and a little toy comes out... but you can't predict which one you'll get). 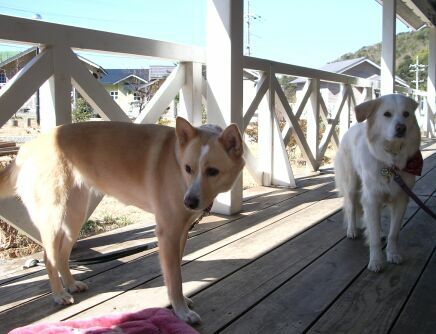 I got a Shiba and Chihuahua, pretty cute! I took so long to write this diary, coz I had hard time figuring out how to arrange it... but I'll never finish if I keep thinking, so I shall dump all the miscellaneous here! I know a lot of people don't think well about training dogs, they believe in giving "freedom" to dogs, and even neighbours have said I am "abusing" Islay, treating her like a "circus animal"... but I believe that by training dogs, we are actually giving them more freedom. 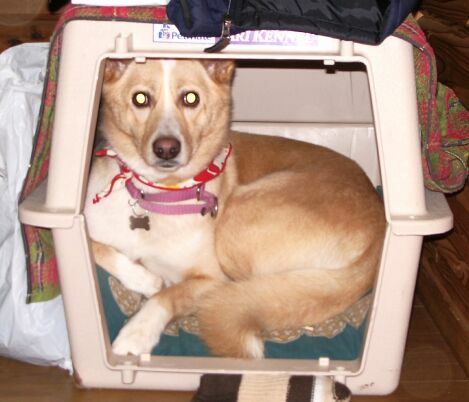 We can take them anywhere, and they're loved and not feared by people, thus easily accepted. Even in camps, it's not just training, they have their share of fun too! 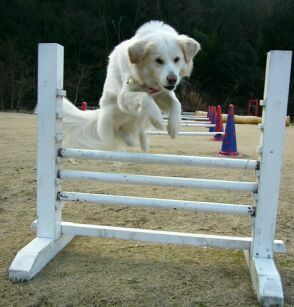 Of course, we try to train in such a way that training itself is a game as well. 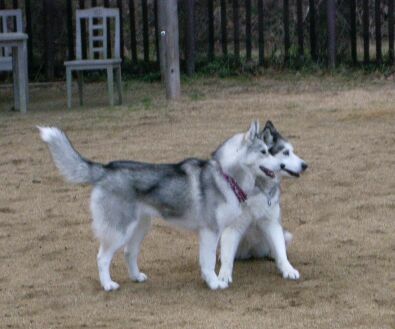 The 2 huskies were having fun wrestling eachother! Julianne seems to have grown younger at heart, with the arrival of the newcomer! Seeing the seemingly violent wrestling, Islay, who's the "referee" dog, wants to intervene... but a bit afraid at the same time. But Islay, they aren't fighting, they're just playing with eachother! 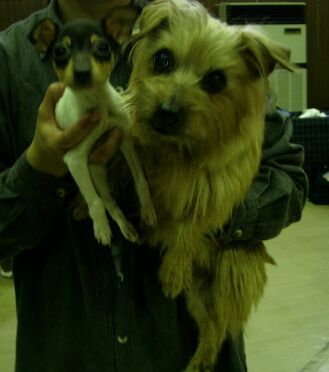 Polka, the Norfolk Terrier, and the newcomer, a Japanese terrier pup! So tiny! Karin, who shared the room with us. 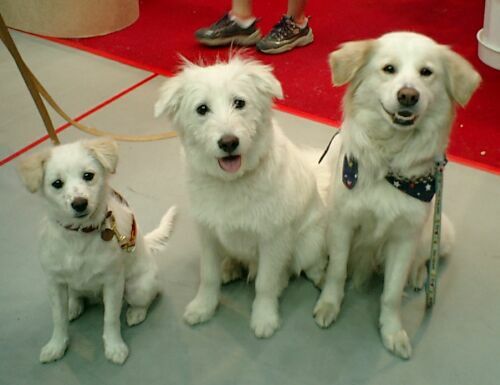 So happy that there were actually 3 mongrels, of the same weight somemore, in the same room! 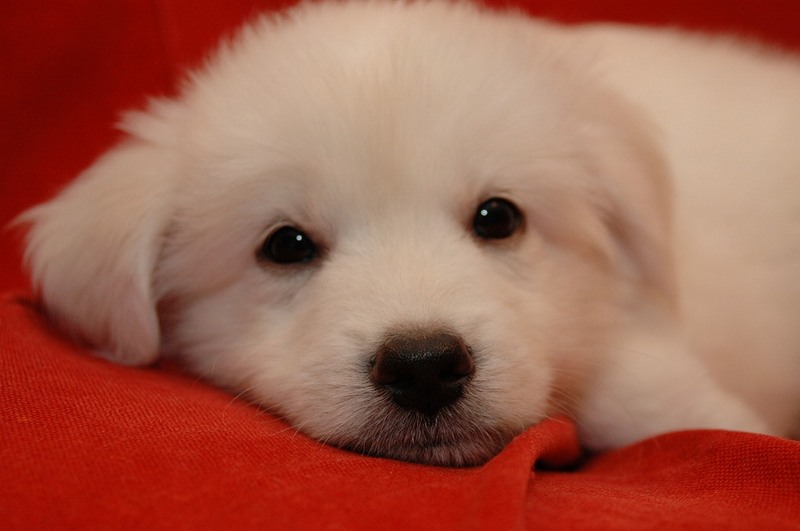 plus a Samoyed. 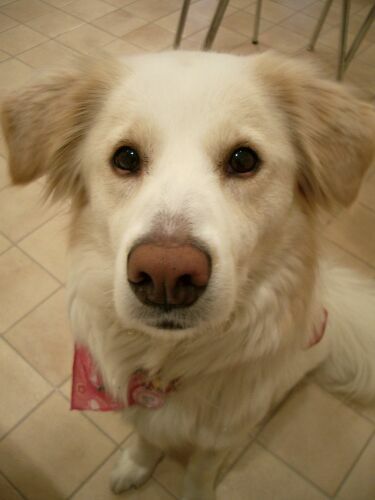 Islay with a Husky cross. 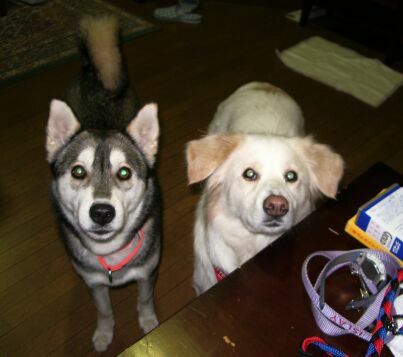 They're both glued to the treats in my hand! 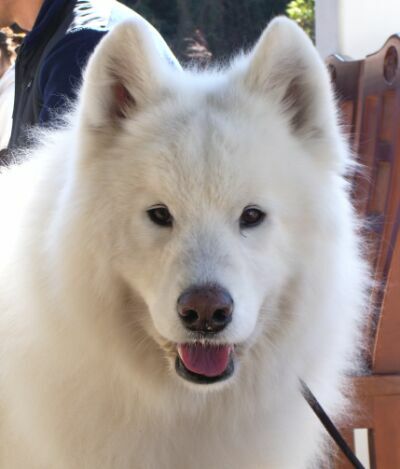 Neu, a very handsome Samoyed, is a grand training champion too! 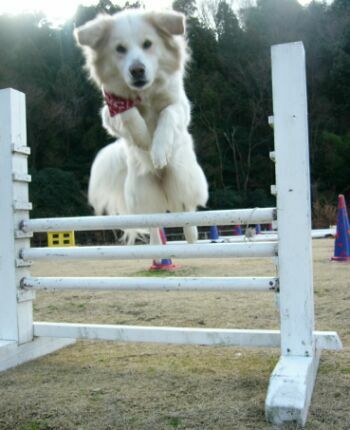 A fantastic example to all, to show that any breed can be trained with the owner's effort! While the humans were frantically thinking of ideas of how to run the scene, Julianne had a certain relaxed atmosphere around her. 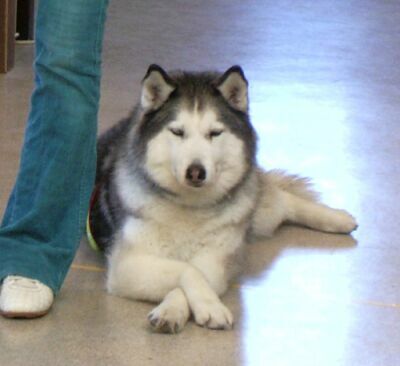 Loves the way she crosses her legs! 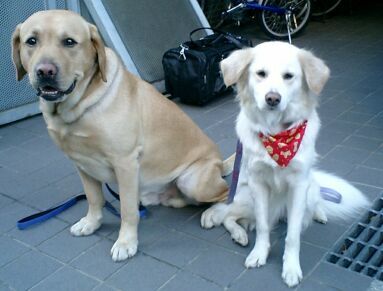 Islay and Karin, waiting outside. 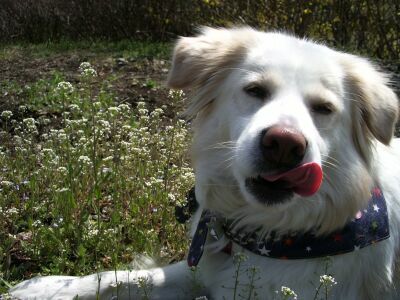 Mmmm, getting kind of hot... and I'm feeling sleepy... ZZZ... seems more human than dog! There were lots of mongrels this time. 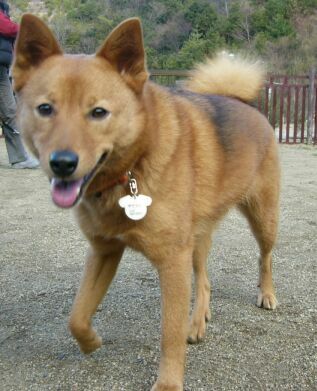 The owner said she looks like the New Guinea Singing Dog, but I felt she looks a lot like the Finnish Spitz, what do you think? 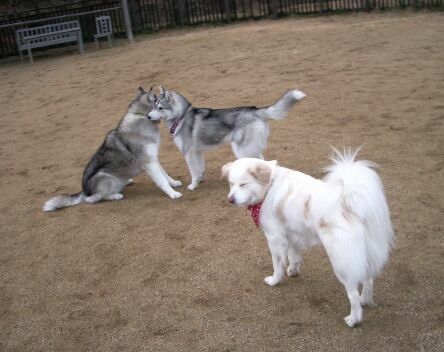 4 mongrels, dispersing to different directions!? 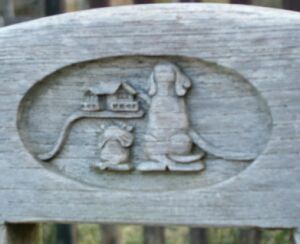 The logo carved on the bench, in the dog-run. 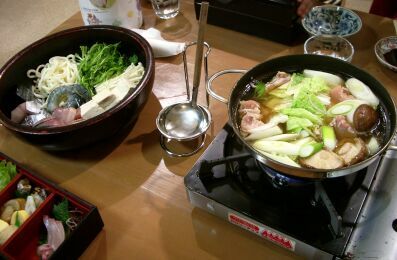 The dinner during the camp was Sukiyaki! Much better than the sushi the day before! Islay had her share too. 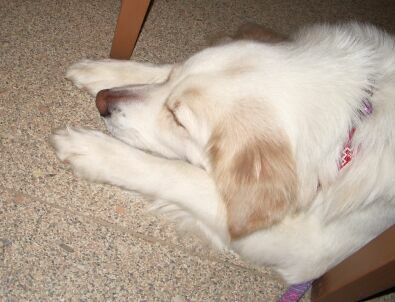 Islay slept soundly under the table during dinner. Things I purchased during the camp. First the click-stick! 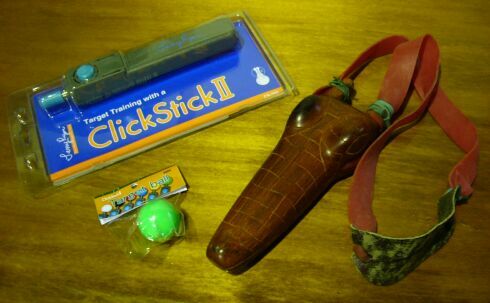 Useful combination of the clicker and target-stick! But the best was the sling made by the Embera tribe of Panama. It has a carving of a crocodile head, and the sling is quite powerful. What surprised me was how it excited Islay! She has always had strong prey-drive, and loves chasing things. But at the gym, she was all freaked out and timid... but the moment I used the sling with a squeaky toy, she changed 180 degrees! 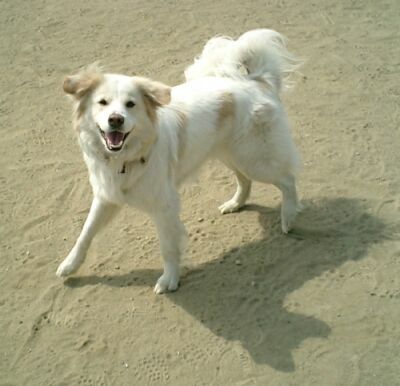 She was all excited, barking and chasing like crazy! I shall use this only once in a while, so that it will always be her "special" item, to get her excited and to keep her spirits up! So glad to have found such a lovely item for Islay! With such strong prey-drive, hope Islay will have fun during the lure-racing on the 19th! Footprints of a bear? 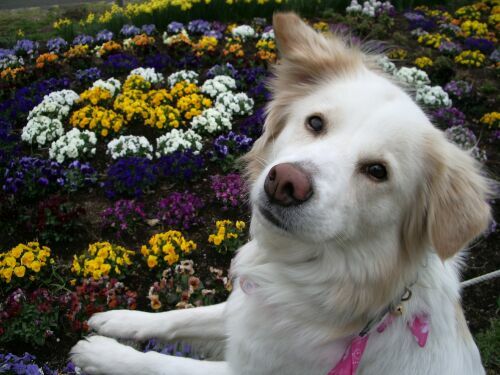 No, actually of a dog! 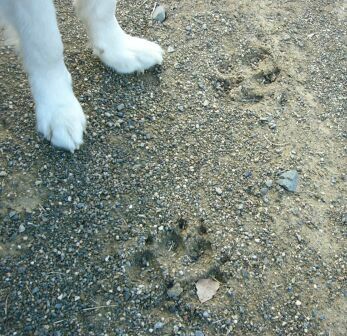 The owners of the lodge keeps huge dogs, like the Great Dane and Leonberger, so the footprints are huge too! 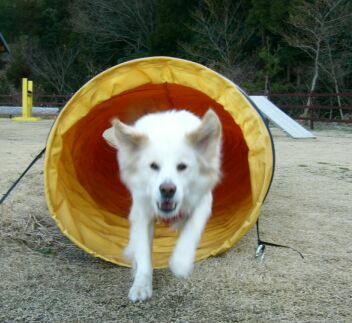 Islay having fun with the tunnel! We stayed another night after the camp, so we had plenty of time to play after the camp. 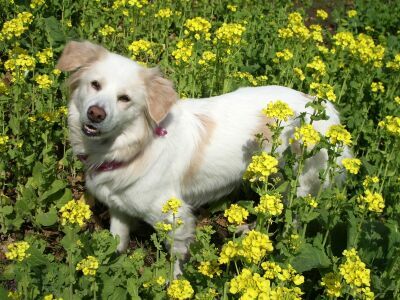 Islay got to enjoy herself a lot before we left for the long drive back! On the road back... I turned a wrong turning, and took the mountain road instead of the straightforward highway. But, the view was magnificent, and I got to see a beautiful rainbow (huge) right in front of me. 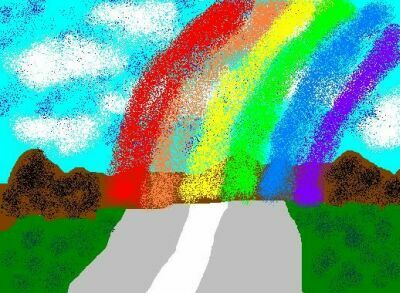 Too bad couldn't take the photo coz I was driving, but I drew a picture. The wrong turn was a blessing in disguise! The long drive back sure was a lovely instead of a tedious one! Just after coming back from Wakayama, was aiko's live concert which I was looking forward to so much! Had to buy more of the tour pamphlets, with Islay's photos in it too! It was a rainy day... and lots of fans had to wait in the rain to get in... but, because of Islay, we were treated differently, didn't have to queue up at all! So we got a fantastic place, right in the centre, 2nd row from front! Wow! I used to sing in a band before, so I loved the live atmosphere, which might be too much for those whose not used to... many fainted and were carried out of the hall too. Should say, I was dehydrated too, but survived, and really enjoyed myself! I was really happy to be right in front of the stage, of course because I could see aiko closer too, but more because I could see the other staff and band members on stage, wearing their backstage pass. 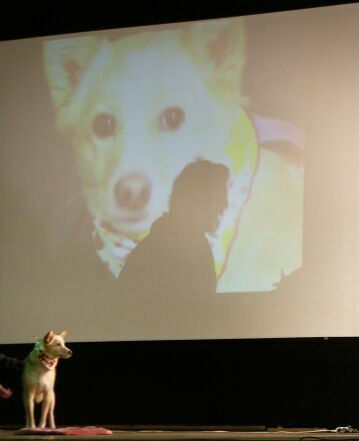 The happiest surprise was that this backstage pass was of the photo of Islay and aiko too! 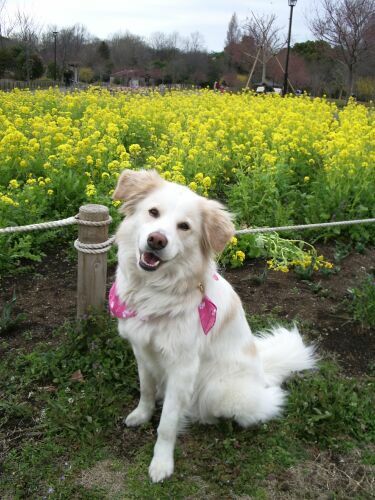 And this photo is not in the pamphlet, so I can't have it. It's really too bad, wish I could at least take a photo of it. It was so lovely, I drew a picture of it, it was similar to the one in the pamphlet of them turning back together, but this one, was looking at eachother so lovingly... really too bad that it was used only for the backstage pass. 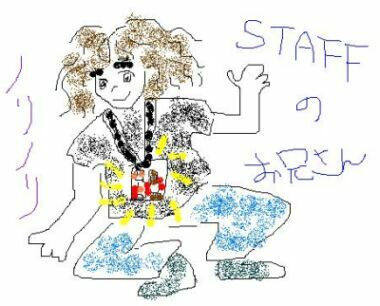 One of the staff wearing the backstage pass was so fun to see, he was banging his head, like in a heavy metal live concert! The live overall was very exciting! 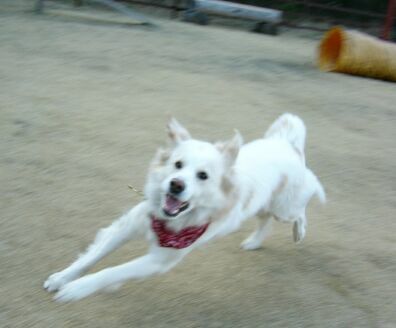 I was overwhelmed when the song, STAR, started to run... because this was the song that ran with the New Year TV commercial of aiko with Islay. Then with the song KIRAKIRA (meaning "twinkles"), lots of shiny twinkles fell from the sky! Was so beautiful! I brought back some of the twinkles as souveniers. At the booth selling the concert items, there was a fairly large photo of Islay displayed too, and I was so happy, instead of buying just the pamphlets, I bought T-shirts and bag as well! Can't be stingy for such a memorable moment! It was all because of Islay I got to experience such happy moments, so I gave steak for Islay to eat when I went home that night! She really deserves it! Although the camp was 2 nights 3 days, I shall summarize it in one entry. 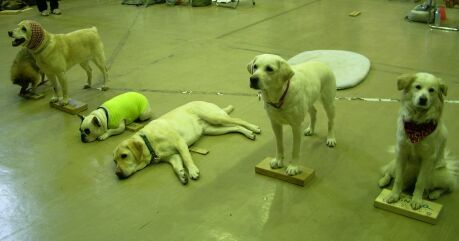 2 Hollywood Animal trainers came all the way to Japan, to guide us through this Film Dog Camp. 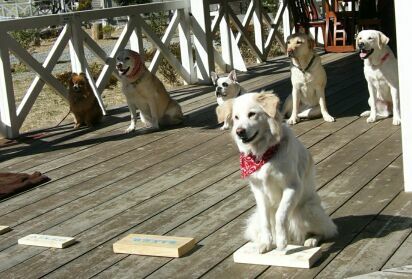 Being crazy about dog movies, and interested in Hollywood training since very young, this camp was something I really had to attend! I attended the one last year too. First, the most important "stay". Staying means, really "staying" no matter what is happening around you, and no matter what kind of environment. 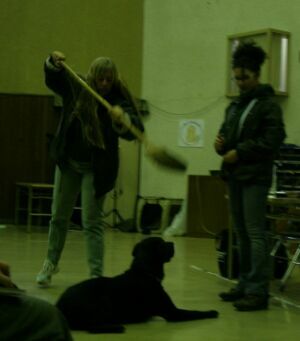 In the photo, the trainer is shaking the broom in front of the dog. 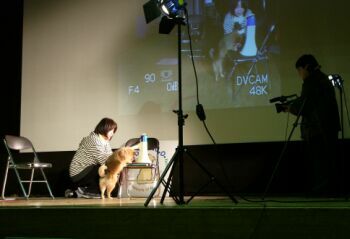 While practicing the stay, there were so many other distractions added, like people squabbling and shouting by the dog, etc. Did Islay manage to stay? Of course not! She was freaked out already, since the bad experience with the big dog the day before, and she was like a stray dog just caught by the dog-catcher, terrified and wanting to run away!! It takes really long for Islay to recover from a single trauma... especially with big dogs, from what I've seen so far... I'd really have to slowly slowly get her used to other dogs... not that I haven't been socializing her since she was a pup. I do think she's a cautious, sensitive, and skittish dog from birth, so I'd really have to work hard on her weak points...　so far in the filming and photography jobs Islay experienced, she was never fearful of the set, in fact she seemed to enjoy the shoot... but there's never a 100% security, so it's better to be prepared for anything there may be. 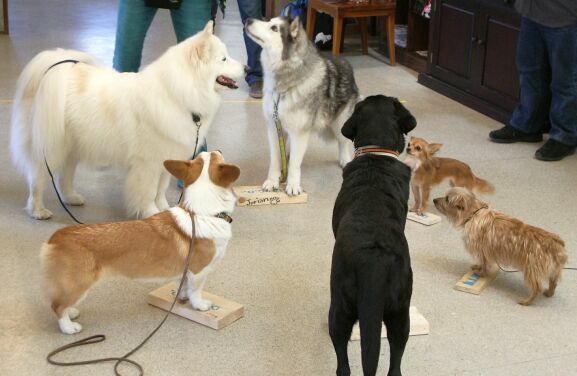 The Hollywood class divided into 2 groups, to do a group scenario. We could choose the scenario, and actually I wanted to do the one that the other group did, because I felt there were more to think about, and I was curious how this could be done... but the other people in the group prefered to do the comparatively easier one. But because we got to see the other group practicing etc, I got to learn a lot from that. 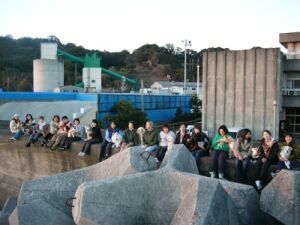 The photo is of the other group. 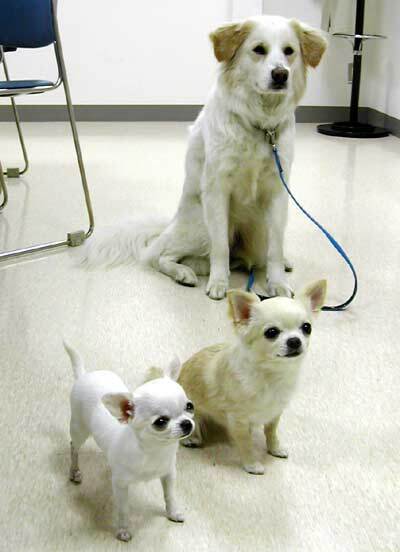 The scenario is, the dogs would run up and form a circle facing each other, like a discussion, and they will go back where they came from. This is the other group scenario, which we did. 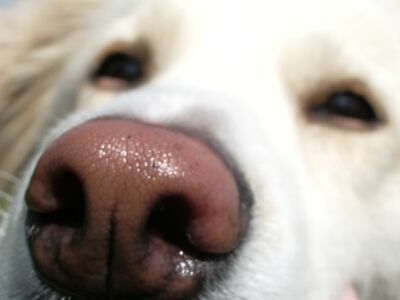 All dogs would walk to their "mark", and each dog will do different things - cover face (Islay did this), bark, lie on the side, lie with head down, spin, and wave. Apart from the group scenario, we had to each practice an individual scenario too. 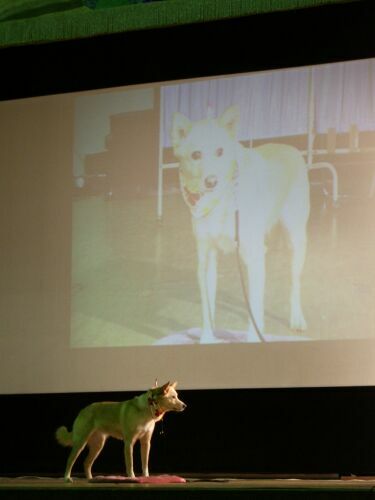 On the 2nd day, the beginner class showed what they learnt, on stage. 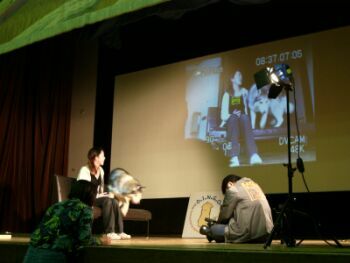 All with a real camera running, and what's filmed, was shown on the wall of the stage. Now Karin's turn. 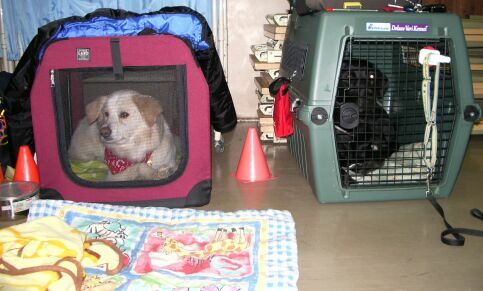 Karin was Islay's room-mate. 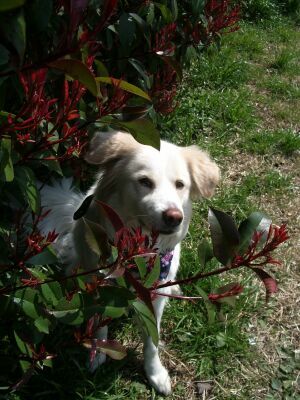 This was her first time, and she was as sensitive, in fact, much more skittish than Islay. But she tried hard too! 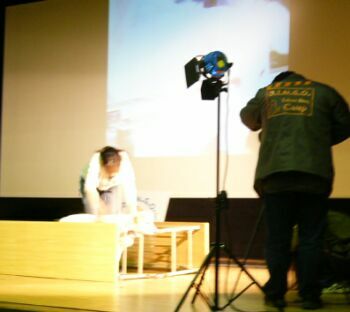 On the 3rd day, the filming of the Hollywood class. 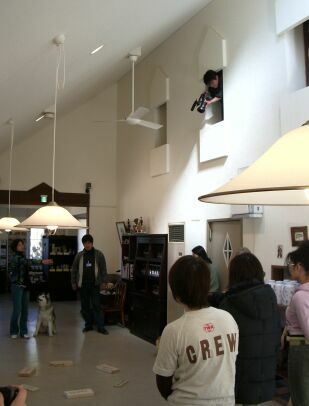 This was done at the lodging, and the camera filmed the scene from the 2nd floor. What was filmed is supposed to be made into a DVD, am really looking forward to it! While watching the other group doing their scenario, my eyes started tearing. It was overwhelming, seeing all the dogs, big and tiny, looking intently at their trainers (owners), and the owners too watching over their dogs to make them act with as little stress as possible. 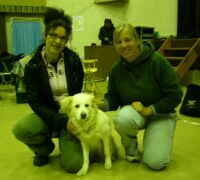 All this can be done only when there's a strong bond and trust between the dogs and trainers, and seeing it was really heartwarming. Now for Islay's group scenario filming. 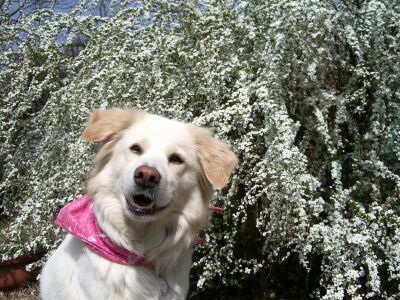 The photo above is of Islay coming up first to do her "cover face". This seemingly simple act, I think must have been quite a feat for Islay. 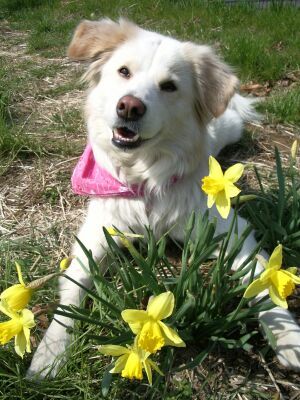 Islay is very cautious of other dogs, and hates having other dogs behind her, thus she can't even run races with other dogs. 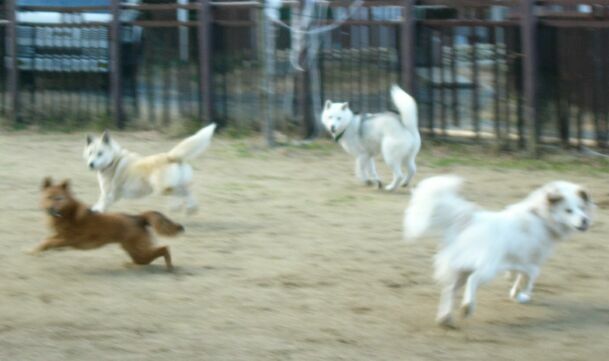 So having to come up alone first, leaving the other dogs including the bigger dogs behind her back, must have been terrifying for her. I could see her showing calming signals, like walking really slowly, scratching, etc... but somehow she managed to work through the filming, and I'm really thankful to her for that! After the group scenario, we moved to the gym to film the individual scenarios. 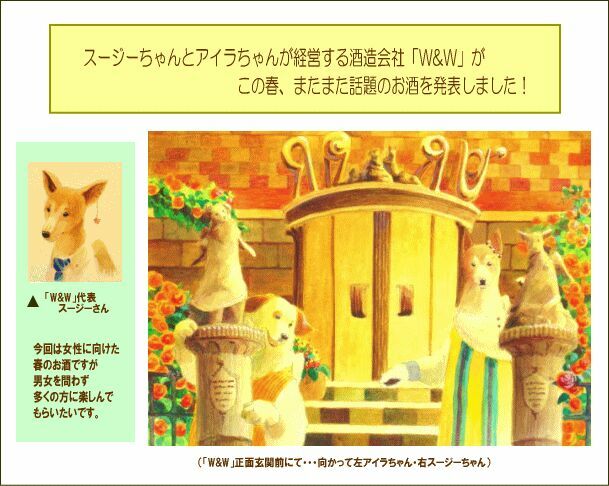 We could choose from 3 different scenarios, and I chose the bathroom scene, where the dog hides from the owner, but then is found and bathed by the owner, and the dog whines and expresses not being happy about being bathed. Islay was initially afraid of the slate, afraid of the table (supposed to be the bathtub), but somehow managed to get her used and she managed to jump into the "bathtub". I let her lie down with head down to hide in the bathtub, and when the "owner" (acted by another person) finds her hiding and tries to lift her up, I asked Islay to continue the lie-down stay, to show she is protesting. While being bathed, I gave the "shame" (lower head) command, and commanded her to whine, to show she's unhappy... and ended off with a head shake. 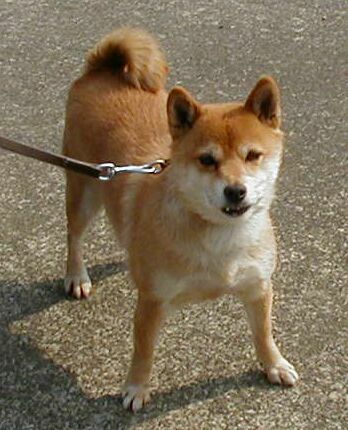 I was actually preparing other things like "limp" (lift front paw), cover face, shake head to one side, etc... but being nervous, and my mind full at the moment, forgot all about that! 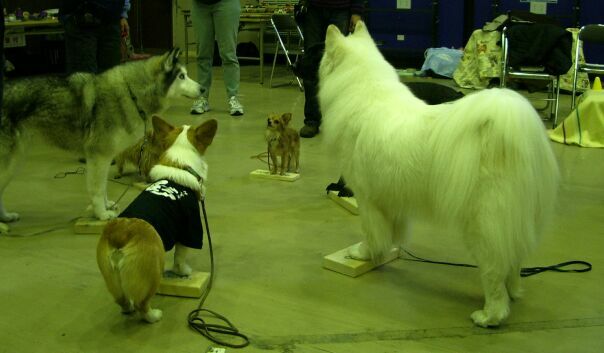 Not only the dogs, but the owners have to learn not to get too nervous in these conditions! I was so nervous I can't really remember how Islay did, though I was happy enough she did listen to my commands in the midst of all that... so I'm really looking forward to checking it out on DVD. Anyway, when I chose this bathtub scenario, I never expected to really have Islay do the bathtub scene in her real-life job! 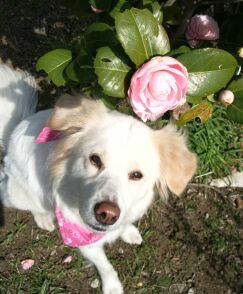 Although it's still photos for a dog book, Islay will be doing a bathtub shoot on the 16th. What a coincidence! But this time, with real water, shower, and shampoo! 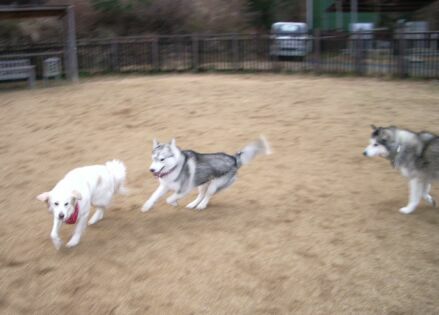 It was fun seeing the other dogs act out the scenarios too. 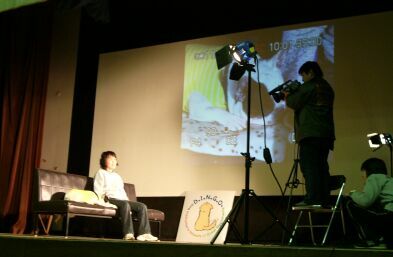 The 2nd scenario was, the dog sits beside the boy, excited. 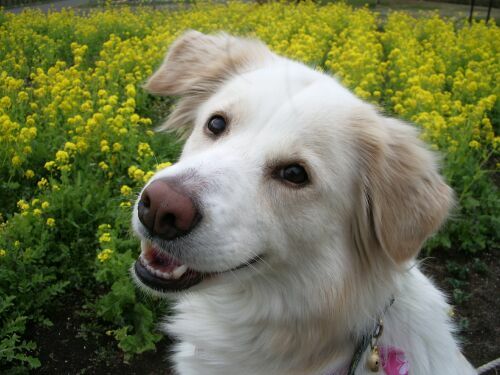 When the boy says something to the dog, he answers with a bark. 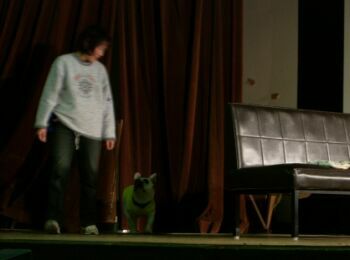 Then the dog goes to "mark", and when called by the mother, runs to the side of the stage, before the boy. There are so many ways to portray "excitement", like jumping up onto and off the sofa, sitting up, pawing the boy, sitting up, spinning, etc. 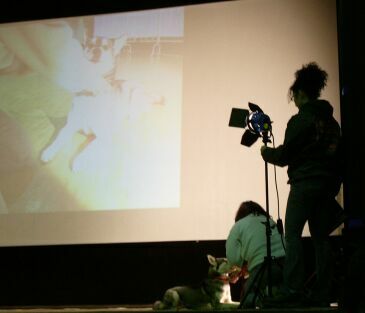 What makes me really interested in dogs "acting", is that there is no one answer to a scene. There are so many ideas you can think of, and it is fun thinking and trying and making it closer to what is requested. Furthermore, you have to give commands from a distance. Like in the photo, you can't see the trainers, i.e. they are that far away. It's really a challenge, but something you can work for, and the satisfaction on achieving it is great too! Exciting! 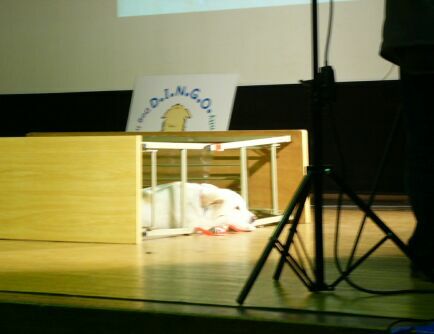 The third scenario is, the dog comes in with the boy. 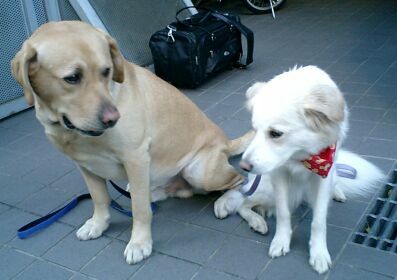 The boy sits on the bench, and the dog slumps down beside him, exhausted. 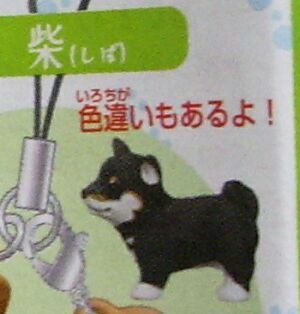 Then they go to the tap, and the boy gives water to the dog, with his hands. 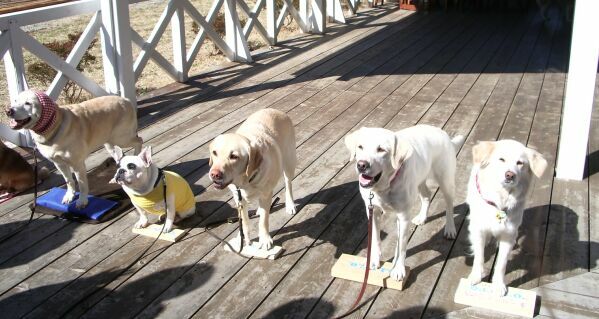 The dog has to follow someone else, and not the owner, but the dogs that acted this did just that, which was very impressive! And the person acting as the boy, was an impressive actress too! 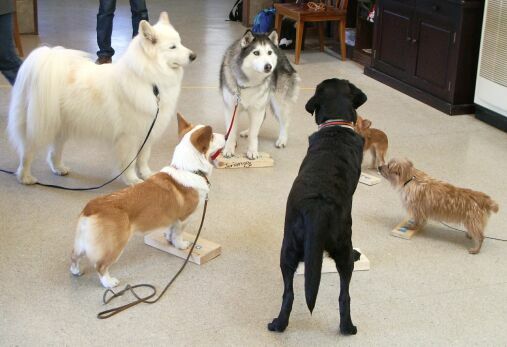 It is really interesting seeing the other dogs act out their parts! We learnt a lot, not only by thinking and doing ourselves, but seeing others too. The 3 days of the camp was full of fun and excitement, and we learnt a lot from it! It sure was worth the long drive! After all the scenarios were acted out, certificates were handed out to us. Last year, Islay was given 5 PAWS, but this year... with Islay being such a scaredy-cat, I wasn't at all confident, but to my surprise, we got 5 PAWS again. Yippeee! 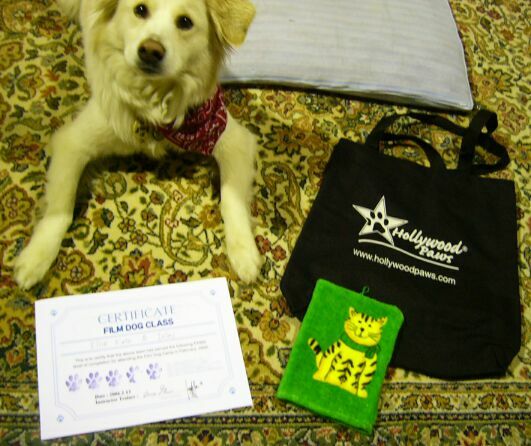 We were all given a Hollywood Paws bag (SOOOO happy!! ), and we could choose a gift, and I chose a towel-type wipe, with a cute little picture of a cat. 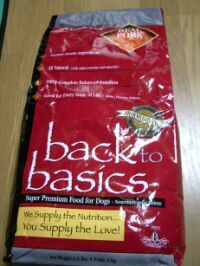 This could come in handy especially for bigger dogs, because they drool... 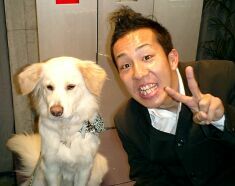 I remember Islay's saliva drooled on aiko's (Jap singer) skirt during a shoot... Thanks so much, to Anne Gordon and Jordan Heppner, for such a wonderful time and experience! 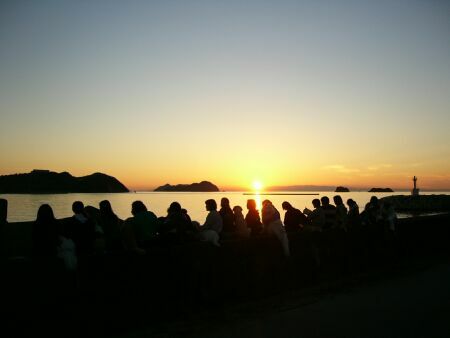 After the camp, we were greeted by a beautiful sunset. Everything was so wonderful, I am already looking foward to next year's camp! I do hope we'll be blessed with a job worth reporting, till we meet again next year... but it has got a lot to do with "luck"... especially for mongrels in Japan... but meanwhile, we'll just have to continue trying, and be prepared for any job that may come!